Hello Oakville, Ontario – CA, “Nawabi Hyderabad House Biryani Place” is extremely delighted to bring our hospitality to your neighborhood, on popular demand. After the Runaway Success of our first franchise in Brampton, we were convinced of having a new location to cater our services far and wide. To begin with, A very big Thank You from ‘Nawabi Hyderabad House Biryani Place’ staff and management to our loyal customers for such a warm Welcome to Canada. The response we got was to say – plainly incredible and this had us expedite the process of having a second international location in such a quick turnaround time. 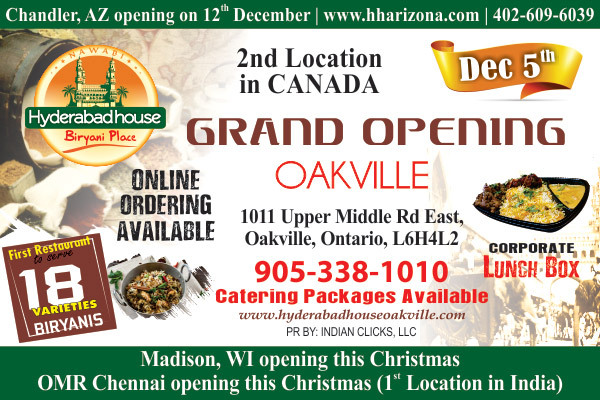 So Nawabi Hyderabad House warmly welcomes all to our new franchise conveniently located in Oakville for the grand opening on 5th December 2018 and experience our finest Authentic Indian Recipes which honour the traditional values in flavour and cooking styles. The diversified menu infuses new commendable recipes and authentic flavors that embraces Hyderabad House’s famed Dum Biryanis, Curry Leaf Chicken, Monagadi Kodi Vepudu, Cashew Chicken, Ulavacharu Kodi Vepudu, Palnadu Mamsam vepudu, Avakai Chicken Biryani, Gongura Chicken Biryani, Vijayawada Chicken Biryani, Ulavacharu Biryani and Rajugari Kodi Pulav are few of the many which are easily accessible for Indian diaspora in the vicinity. Special mention of Lunch specials such as Thali to be served both in Veg and Non-Veg offered from Monday to Friday and Lunch Box for takeouts. Gear up for our Weekend specials – Serving signature dishes crafted by our in-house chefs which have been mastered over the years with true customs. While you are there, don’t forget to inquire about our catering specials which are tailor-made and on demand. Excited with our new location, Franchisees Prakash Reddy, Ven Prasad and Madhuri said that it gives them immense pleasure to bring the legacy of the famous Biryanis, Pulavs, Signature Appetizers and other exclusive Indian dishes of Nawabi Hyderabad House to Oakville, Canada. In their own words from franchisee owners – Franchisors Siva Yarlagadda, Vamsi Kallepalli and Raja Kalidindi have been of great support and made the progress seamless and dependable for the future. Nawabi Hyderabad House has been and continues to be dedicated to the promotion of our Fine Indian Cuisine Culture to a wider audience. 3rd location in Canada is gearing up and is expected to open in the First Quarter of 2019. Siva Yarlagadda and Vamsi Kallepalli, are delighted to announce their expansion into Indian Market. Opening 1st location in Chennai, India during the Christmas season of 2018. For more details about the location please reach out to Jay Kumar @ 91 98843 94929. Previous articlePPLM Contest – Got A Love Story? What Do You Name It?